Big cities have historically been seen as an important prerequisite for a country’s economic growth. In recent decades, however, developing countries have rapidly urbanised, and large cities are increasingly found in relatively poor countries. This column uses a new dataset to revisit the relationship between city size and economic growth. It finds that relatively small cities (with populations under three million) have been more conducive to economic growth, while very large cities are only growth-enhancing in countries with a very large urban population. Are the world’s megacities too big? For a long time in world history, building an empire around a city or having a large city within a country was considered crucial for economic success and/or political dominance. Alexandria around 200BC, Rome in 1AD, and Chang’an, China in 800AD are clear examples of this (Chandler 1987). Big cities brought about development and prosperity; and development, in turn, made the growth of big cities possible. Partially inspired by this observation, policymakers and economic theorists have long stressed the role of urbanisation and cities for economic efficiency and growth (Duranton 2015, Glaeser et al. 1992, World Bank 2009). The size of a city, in particular, is considered an important driver of economic development. Based mainly on empirical evidence from the US and the UK, research has stressed how large cities lead to greater productivity and economic growth through the generation of agglomeration economies which allow for a more productive use of available resources (Melo et al. 2009, Rosenthal and Strange 2004). Over the past few decades, however, the world has changed significantly and these changes have put the link between large cities and economic success under greater scrutiny. As Figure 1 shows, countries at low levels of economic development have rapidly urbanised, and very large cities are no longer predominantly found in rich and/or dynamic countries (United Nations 2014). 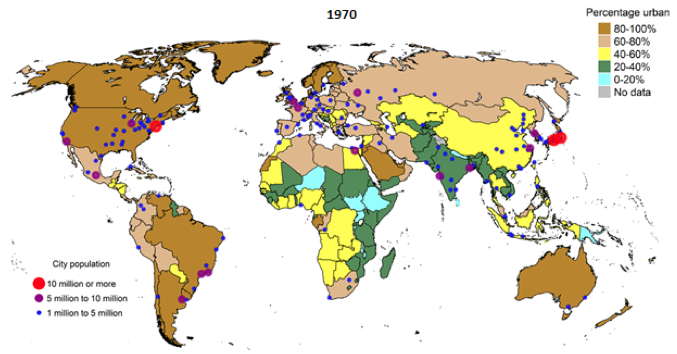 Moreover, cities have grown much larger. This has challenged the city size/productivity link and is posing questions about the extent to which large cities can still be considered the main drivers of economic growth across countries with different levels of development. In a recent paper, we delved into the link between city size and aggregate economic growth in order to advance the understanding of the factors that may influence this relationship (Frick and Rodriguez-Pose 2017). In particular, using a panel of countries for the period between 1980 and 2010, we explored empirically whether certain city sizes that have been more growth enhancing than others in recent decades, and which factors are the main drivers behind the city size-growth relationship. Analysing the relationship between different city size categories and aggregate economic growth is important for different reasons. Most past research has focused on the relationship between either urbanisation and growth or urban concentration (normally using a single urban size threshold) and growth (Brülhart and Sbergami 2009, Castells-Quintana 2017, Henderson 2003), overlooking the city size dimension. Yet, while many small countries have high degrees of urban concentration, their main cities are relatively small. In contrast, many large countries have multiple large cities, but their degree of urban concentration is low. It is therefore conceivable that both urban concentration and city size may impact economic growth, but that the channels differ according to country size. In addition, city size is far from the main factor contributing to economic performance. Many other factors, such as urban infrastructure, governance, and industrial composition play a non-negligible role in the economic fortunes of cities. This question has attracted increasing attention over the past years in the economics literature (e.g. Camagni et al. 2013, Castells-Quintana 2017, Glaeser 2014), but has – with few exceptions – rarely been tested empirically to date. How can the link between city size and economic growth be tested? We use an econometric model built around a simple GDP per capita growth equation, based on an extended Solow growth model, to estimate a country’s growth rate in five-year periods (between 1980 and 2010) as a function of the size of a country’s cities (see Frick and Rodríguez-Pose 2017). We complement the model with a set of control variables commonly used in growth regressions which include the initial GDP per capita of the country, years of schooling as a proxy for human capital, private investment as a percentage of GDP, urban infrastructure, and government effectiveness, among others. 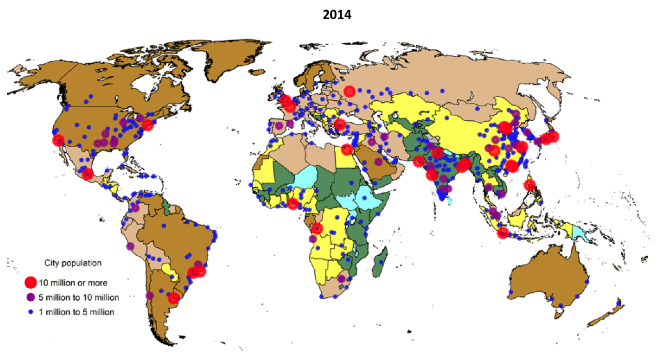 A new dataset covering a total of 113 countries was assembled using data mainly from the World Urbanisation Prospects (WUP), which provide information on the percentage of the urban population living in cities of different size categories (United Nations 2014). The large and exhaustive coverage of the dataset allows for a more detailed and extensive treatment of indicators of urban size categories for a large number of countries. Which city size categories have been behind national economic growth? Two important facts can be extracted from the analysis. First, and in contrast to expectations, most of the growth dynamism takes place at the lower rather than the upper echelons of the urban hierarchy. Small cities with a population of less than 500,000 inhabitants seem to have been an important source of economic dynamism. By contrast, a large share of the urban population living in cities between 500,000 and 3 million has been detrimental to economic growth. Beyond that threshold, the size of cities in a country has not affected its economic performance in a positive or a negative way. The results suggest a non-linear relationship between city size and economic growth which is greatly dependent on the country’s size. A larger share of the urban population in small cities of less than 500,000 inhabitants has been growth-promoting mainly in small and medium-sized countries (those with an urban population below 12.3 million). Second, the size of the country matters for the link between population living in cities of different sizes and growth. The positive connection between small cities (below 500,000) and national growth levels has worked best in relatively small countries, while for countries with more than 12.3 million urban citizens, the relationship has been negative. The negative effect of the 500,000 to 3 million categories was only present in countries of up to 4 million urban inhabitants. Megacities beyond 10 million only fuelled national growth in countries with more than 28.5 million urbanites. Roughly speaking, the analysis underlines that country size matters for the relationship between city size and national economic growth – small cities work best in relatively small countries, megacities in big countries. Medium-sized cities are only detrimental to economic growth in very small countries. Megacities can thus only be considered a force for aggregate economic dynamism in the most populous countries. The analysis also stresses how this relationship is highly context dependent. Three factors – a high share of industries that benefit from agglomeration economies, a well-developed urban infrastructure, and an adequate level of governance effectiveness – allow countries to take advantage of agglomeration benefits from larger cities (i.e. between 3 and 7 million inhabitants). These also reduce the benefits of having a large share of the urban population in small cities below 500,000 inhabitants. Overall, larger cities can indeed be drivers of growth, but only if the context is favourable. For many countries, smaller cities in fact provide a better balance between the advantages of cities and the diseconomies arising through growing cities. The results add important further nuance to the scarce empirical literature that links city size to aggregate economic performance, which tends to emphasise the benefits of increased city size (Brülhart and Sbergami 2009, Rosenthal and Strange 2004). By using more detailed indicators for the size of a country’s cities, it becomes evident that the benefits of increasing city size are not without limits and, for many countries, smaller cities seem to offer a better balance. These findings are particularly pertinent in the current context in which – in contrast to previous centuries – the largest cities are now in developing countries and not in the developed world. A continued focus on the benefits of large cities over smaller ones without considering the context may lead to simplified and non-adequate policy recommendations, in particular in developing country contexts. Brülhart, M and F Sbergami (2009), “Agglomeration and growth: Cross-country evidence”, Journal of Urban Economics 65(1):48-63. Camagni, R, R Capello and A Caragliu (2013), “One or infinite optimal city sizes? In search of an equilibrium size for cities”, Annals of Regional Science 51(2):309-341. Chandler, T (1987), Four thousand years of urban growth: An historical census, Lewiston, NY, USA: St David's University Press. Duranton, G (2015), “Growing through cities in developing countries”, World Bank Research Observer 30(1):39-73. Frick, S and A Rodríguez-Pose (2017), “Big or small cities? On city size and economic growth”, Growth and Change, forthcoming. Glaeser, E L (2014), "World of cities: The causes and consequences of urbanization in poorer countries”, Journal of the European Economic Association 12(5): 1154-1199. Glaeser, E L, H D Kallal, J A Scheinkman and A Shleifer (1992), “Growth in cities”, Journal of Political Economy 100(6): 1126-1152. Henderson, J V (2003), “The urbanization process and economic growth: The so-what question”, Journal of Economic Growth 8(1):47-71. Melo, P C, D J Graham and R B Noland (2009), “A meta-analysis of estimates of urban agglomeration economies”, Regional Science and Urban Economics 39(3): 332-342. Rosenthal, S and W Strange (2004), “Chapter 49: Evidence on the nature and sources of agglomeration economies”, in J Vernon Henderson and J F Thisse (eds), Handbook of Regional and Urban Economics, Burlington: Elsevier, pp. 2119-2171. United Nations (2014), World Urbanization Prospects: The 2014 Revision. World Bank (2009), World Development Report 2009: Reshaping Economic Geography, Washington, DC. The categories we use are: 1) below 500,000 inhabitants, 2) 500,000 to 1 million, 3) 1 million to 3 million, 4) 3 million to 7 million, 5) 7 million to 10 million and 6) 10 million and more.